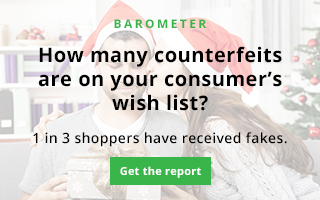 This holiday barometer unwraps increasing trends in both online shopping as well as counterfeiting. Read the Global Online Shopping Survey – Counterfeiting Concerns, to learn what 3,400+ survey participants from nine countries had to say about the impacts of counterfeiting in online gifting experiences. Eighty-six percent of consumers believe that brands should be doing more to protect customers from buying fake goods. Consumers on average complete nearly half of their shopping, outside of groceries, online. Thirty-one percent of respondents have accidentally bought a fake product, a figure up 35 percent from research last year. Respondents place the most trust in online marketplaces — evidenced with a confidence rating of 86 percent.